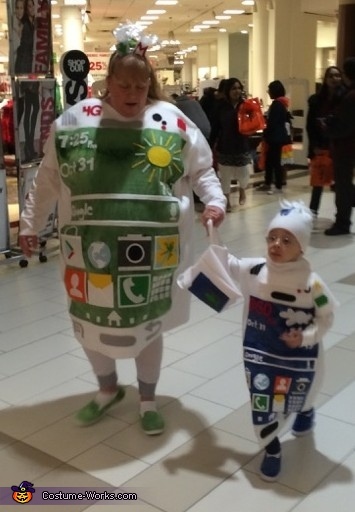 Hello im Rochelle the (mom) with my (son) O'Dane and together we are wearing these Samsung Cell Phone Costumes that i have made. I am so happy to be a part of this experience with him every year, to see the smile on his face is priceless. It was my idea to create something different again this year. I've been making my sons Halloween costumes for the past 4 almost 5 years since he turned 1 and i love it. Im a crafty person and it is so special to me to be a part of this with him. I will continue to make his costumes every year as he allows me to.